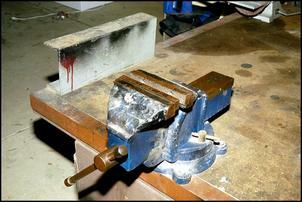 A bench vice is probably the single most valuable tool you can permanently mount in place. If you can hold whatever you’re working on firmly and steadily in place, you’ll find the outcome vastly better – in terms of results, ease of use, and safety. So what is there to know about a bench vice – all self-explanatory isn’t it? Not really – let’s take a look. Bench vices come in a variety of shapes and sizes. 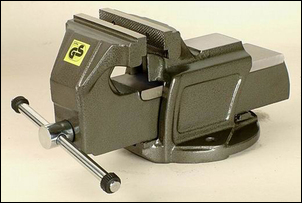 There are two primary aspects that determine a bench vice’s size – width and opening depth. 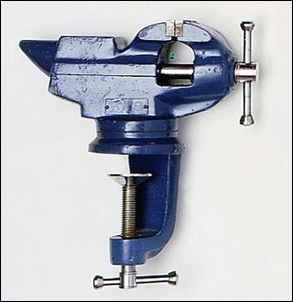 The vice is normally specified by width alone – eg a “100mm engineer’s vice”. The ‘engineer’ bit means that the vice is designed for metalworking rather than woodworking, while the ‘100mm’ refers to the width of its jaws. Many people like the idea of starting off with a small vice that screw-clamps to the bench. In short: don’t. In operation you’ll find it unhappily sloppy – typically, moving around when you try to file or cut an object held in its jaws. These vices are generally only low in strength, so you will also not be able to apply sufficient clamping pressure to the work-piece. Instead, a 100mm vice of the sort pictured is an excellent beginners’ vice. Its cost will be low but it is still large enough to perform many useful functions. Even a relatively small vice like this should have a base that allows it to be bolted to a bench and should have removable jaws. Note that this design of vice does not allow long, wide items to be clamped vertically. 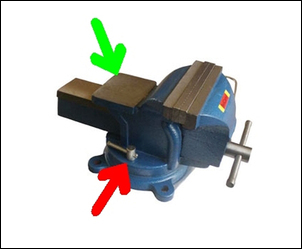 This vice has two additional features – a swivel base (red arrow) and an anvil surface (green arrow). Both sound really useful but are not particularly helpful in real-world use. 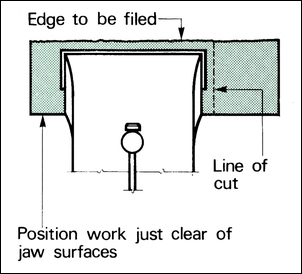 Unless tightened hugely, the swivel base will tend to allow the vice to turn when high forces are being applied (eg a steel strip is being bent to form a bracket), and the ‘anvil’ part of the vice is hard to access – much better to get an old lump of railway line or steel beam and use that when hammering items flat. The next size up of vice is a 150mm design, and after that you can get a 200mm vice – the latter getting very large indeed! The best advice is to start with the 100mm vice and then if you find you often need a larger vice, to buy a second vice with wider jaws. Keep the first vice mounted – you’ll find it useful to have two vices. An example of where having two vices is useful is when you have a job carefully set up in one vice and then have a short-term need for another vice. This occurs more often than you’d first think! When upgrading to a large vice, you might also want to look for one with offset jaws. This design allows you to clamp long items vertically in the vice. Over the years I have used both cast iron vices and those fabricated (ie manufactured by being welded together from steel parts). Both types work well – I wouldn’t worry too much about the construction, so long as the vice is from a recognised manufacturer. Strange as it sounds, mounting the vice is perhaps the most important aspect of vice-use to get right. If the vice is mounted incorrectly, it will be hard to use and may even be dangerous. 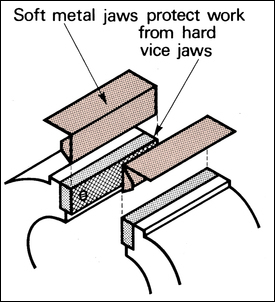 A vice must be mounted so that when you are standing next to it, the top surface of its jaws is level with your bent elbow. If the bench top is too low, the vice can be raised with a hardwood block. 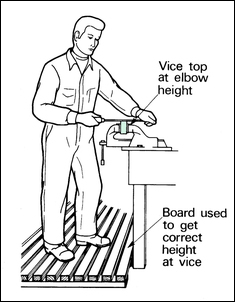 If the vice is too high, you can stand on a rubber or timber board. 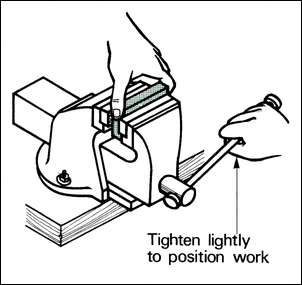 Having the vice at the correct height will allow much more accurate filing and hacksaw cutting – your fore-arm will be able to move back and forth horizontally. A vice must be very securely mounted. This has implications both for the way in which it is attached to the bench, and how secure the bench itself is. 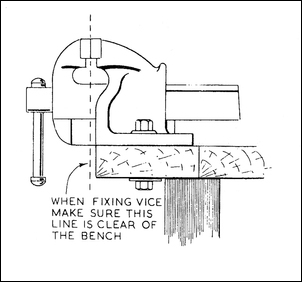 Some books recommend the use of coach screws to attach a vice to a bench – but don’t! 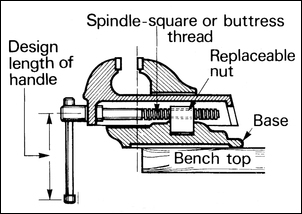 Instead, use heavy-duty bolts, nuts and washers to securely bolt the vice to the bench. Large vices use four bolts, while smaller vices may use only two. It’s no use attaching the vice securely to a bench if the bench can then ‘walk’! The heavier the bench, the better. If you’re working with a bench that is not bolted down and is lighter than desirable, at least make sure that it has a lower shelf on which weighty objects can be placed. A bench that is not bolted to the floor needs to have a mass of at least 150kg if it isn’t to be easily moved around by objects being manipulated in a 150mm vice. 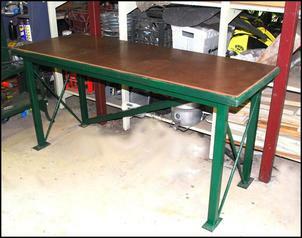 If used to mount a vice, this bench should be bolted to the concrete floor. Note the 'feet' that can be used for this purpose. 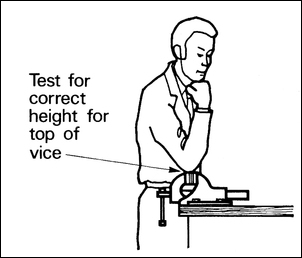 As we’ve indicated above, vices are normally mounted on heavy benches. But where on the bench? This is a deceptively tricky question. 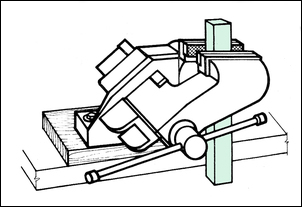 As shown in this diagram, the parting line of the vice is best positioned so that it very slightly overhangs the edge of the bench. 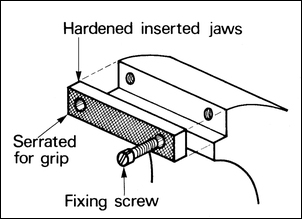 In that way, long items can be vertically mounted in the jaws of the vice – and that’s even more important when mounting a vice with offset jaws. Vices use hardened and serrated steel jaws to grip the work-piece. These jaws are removable and can be replaced if worn. In normal use, make sure the jaws are kept tight. The serrated jaws keep a tight grip on the work-piece but they also inevitably mark it. So in most situations, the jaws are covered with soft metal jaws. The easiest way of making these is to cut some short sections of aluminium angle a little longer than the width of the jaws. The work-piece is positioned within the jaws of the vice and the vice just nipped-up. The work is then rechecked for location, keeping in mind that you don’t want your hand tool (eg a file) to touch the hardened jaws of the vice. The vice is then firmly tightened by hand. 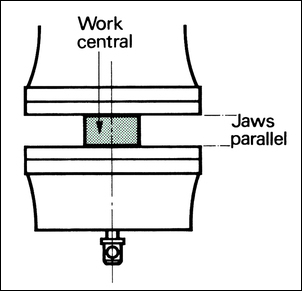 Normally the full width of the jaws is employed to hold the work-piece (or the work-piece is centred, as here) but sometimes the item must be positioned at one end of the jaws. Note, however, that doing this frequently over a longer period will distort the jaws – as a result, the clamping force will no longer be even across the jaws’ full width. Normally in a section on use and abuse of a vice you’ll find a bunch of points like: never put an extension lever on the vice handle to tighten it up, never apply heat to an object clamped in the vice, never use a big hammer to bend bar held in the vice. And so on. But realistically, over a long period of using a vice, it’s very likely that you’ll end up doing all of these things – not on a regular basis, but when it’s required. Along with inadvertent touching of angle grinder discs against the jaws, and normal wear and tear, over time the vice will lose its effectiveness. The thread will get sloppy, the jaws will no longer be parallel (or possibly even at the same height) and as the vice is tightened, the jaws will change in angle. When a vice gets like this, buy another. It’s simply not worth working with a vice that is worn – too many stuff-ups then occur. And, for the same reason, be wary of buying secondhand vices. 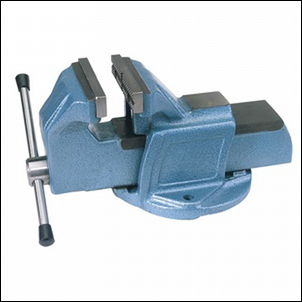 A well set-up vice is more than just another pair of hands – it’s a pair of hands of immense strength and rigidity! Every workshop – no matter how big or small – should have a good vice. It’s as simple as that.